Can Bottles and Pacifiers Harm Your Baby’s Teeth? Does your baby love their pacifier, but you’re worried it may cause dental issues later on? Is your baby not ready to wean from bottles despite your efforts? Are you concerned that using them too long will cause problems? Sucking on a pacifier or bottle can be soothing for a young child, but can, unfortunately, lead to dental problems as they get older. Even though baby teeth are temporary, they are still important and susceptible to cavities and other dental problems. They even influence how adult teeth will form. In this post, we will discuss the effects pacifiers and bottles can have on teeth, how to avoid potential related dental problems, and when and how to wean your child from the paci and bottle. Pacifiers can be beneficial for babies and parents as they satisfy a baby’s natural sucking instinct and provide a form of comfort. They have also been shown to reduce the risk of sudden infant death syndrome (SIDS) between the ages of one and six months (source). Front teeth not meeting: Front top teeth to slant out and front bottom teeth to tilt in. Jaw misalignment (such as an overbite). Narrowing of the roof of the mouth. With proper use of a pacifier, your baby can self-soothe without developing dental problems. Wean your child from their paci by the age of two to reduce the risk of pacifier teeth (source). Even better, stop using the pacifier between 9 and 12 months. The habit can be tough to break once the child is walking or crawling, because they can go searching for it on their own. Using pacifiers labeled as “orthodontically friendly” may lower the risk of dental issues. You could also limit pacifier use to sleeping times. This reduces the usage time, while still lowering the risk of SIDS. Distractions: When your child asks for their paci, distract them with other activities, such as reading, coloring, playing with their favorite toy, etc. 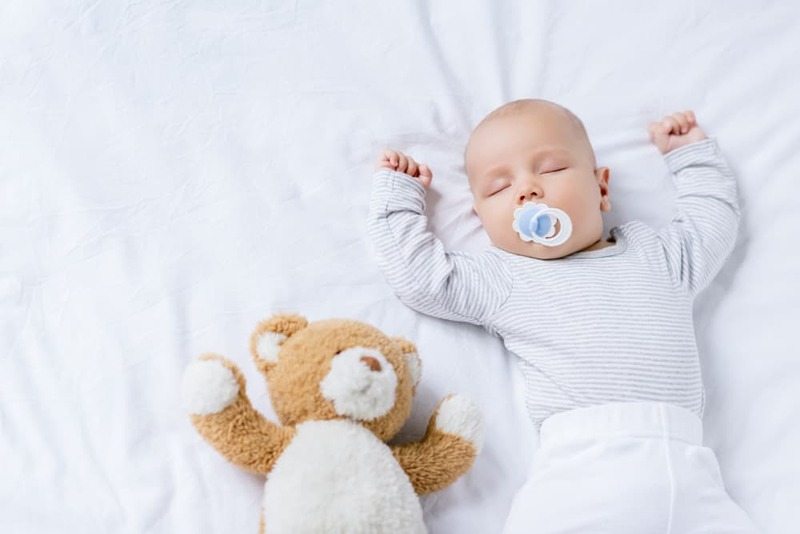 Offer a transitional object: Because pacifiers are often a form of comfort, offer your child a transitional security object, such as a blanket or doll. Encouragement/praise: Tell your child “What a big girl/boy you are!” when they aren’t using their pacifier. Rewards: Use positive reinforcement and give your child a sticker when they decide not to use their pacifier. Offer other forms of comfort: Comfort your child in other ways when they need to be soothed. Sing to them, rock them, etc. Avoid stressful situations as much as possible when starting to wean: It’s probably not the best idea to wean your child off their paci when you’re about to move, going on a big vacation, or about to have another child. Don’t scold/punish/use negative reinforcement when your child does use the pacifier. Cold turkey with an epic farewell event: Going cold turkey may be the best option for some children. Tie a ribbon to your child’s pacifier and let it “fly” away. Bottles provide a form of nourishment and are a necessity if you’re formula feeding or pumping. However, many children use a bottle much longer than necessary, which can lead to dental concerns. Bottles carry the same risks associated with prolonged sucking as the pacifier. Plus, they pose a risk of promoting cavities and baby bottle tooth decay if they contain anything other than water. Tooth decay in infants and toddlers is often to referred to as baby bottle tooth decay. It can occur from frequent sucking/sipping on milk or juice over an extended period. This condition mostly happens when parents put their baby to bed with a bottle, use a bottle as a form of comfort, or prolong its use. When sugars and carbohydrates come in consistent contact with teeth, decay-causing bacteria flourish, rotting away the child’s teeth. Tooth decay is nothing to take lightly, as it can lead to painful infections. In extreme cases, tooth extractions or extensive dental treatments may result (source). If you notice any white spots on your child’s teeth, particularly near the gum line, contact your dentist, as this is an early symptom of baby bottle tooth decay. The earlier you get your child to the dentist, the less extensive and invasive the treatment will be. Brown or black spots on the teeth. Fever (which could indicate an infection). If your child has any of these late symptoms, get them to the dentist as soon as possible to prevent the decay from spreading further and leading to extensive restoration treatments or even tooth loss (source). The best approach to baby bottle tooth decay is to prevent it, and here are some ways you can do so. Wean your child from the bottle by 18 months of age, preferably by 12 months. Leave milk for mealtimes only, after your child has weaned from the bottle. Only offer them water to sip on throughout the day. Do not give your baby a bottle when putting them to sleep or down for a nap. Place only formula, milk, or breast milk in bottles. Do not give your baby/toddler juice or any other sugary drinks in their bottles. Do not use the bottle as a pacifier or form of comfort. Limit acidic foods and juices. Practice good oral hygiene: Brush your child’s teeth twice a day with a pea-sized amount of toothpaste. Always brush their teeth before putting them to bed. Start your child’s dental visits early (source). Start early and introduce the sippy cup around six months of age. Once your baby has the sippy cup figured out, start replacing one regular bottle feeding a day with a sippy. Do that for three days in a row before adding another feeding. Do not coincide initial bottle weaning with stressful events, such as a move, vacation, starting daycare, or the birth of a new sibling. Offer lots of praise and positive reinforcement when your child uses a sippy/cup instead of a bottle. Offer other forms of comfort: Many times, caregivers will first turn to a bottle when a baby is upset, when they might not even be hungry at all. Provide other forms of comfort, like singing, rocking, or a security blanket first. Go cold turkey and have a farewell ceremony: For some toddlers, you may just need to ditch the bottle, cold turkey. Involve your toddler and “send” their bottles away. Explain to them they are a “big girl/boy” now and don’t need bottles anymore. Bottles and pacifiers are beneficial for babies and parents as they provide nourishment, satisfy baby’s natural sucking instinct, and can provide comfort and security. However, the long-term use of bottles and pacifiers can lead to dental issues. These include crooked teeth, misalignment of the jaw, and baby bottle tooth decay. You can prevent related dental issues by weaning your child from a pacifier by age two and from the bottle by 18 months. By weaning early on, you and your baby can reap the benefits of bottles and pacis without harming your child’s smile. When did your child stop using their paci? Did they have dental issues from overuse of a bottle or pacifier? Share your experiences with us in the comments and be sure to share this post with other new parents. What are the Best Baby Bottle Warmers?